The concept of using dogs and other domestic animals for therapeutic purposes is not new. The human-animal bond has existed for thousands of years and is an essential component to the success of programs utilizing animals. There is mention of animals being used therapeutically as early as the 9th century in Belgium. In 1982, the American Veterinary Medical Association officially recognized the human-animal bond due in part to hundreds of clinical trials that confirmed what people have known for thousands of years: petting an animal significantly reduces stress and anxiety. Research has shown a dramatic, measurable decrease in heart rate and blood pressure when a person interacts with a therapy animal. It works by reducing the amount of cortisol, a stress-inducing hormone, in the blood stream. 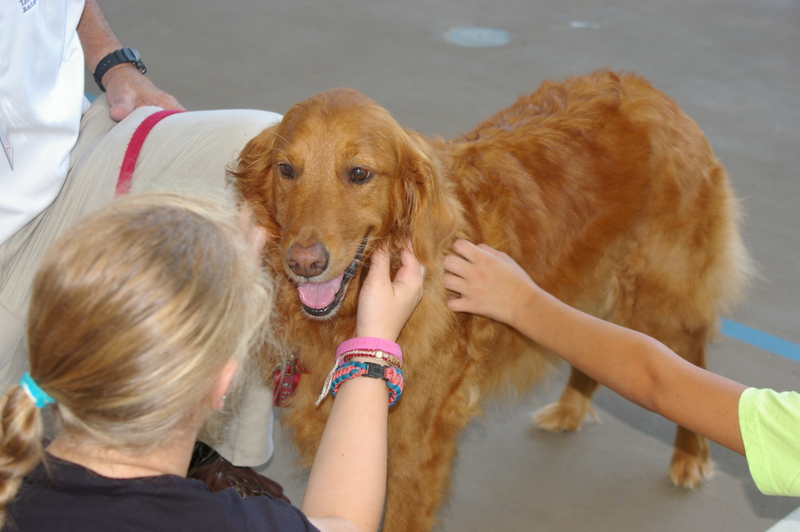 Animals have a calming effect on people, help reduce anxiety and can encourage socialization. Petting a dog or cat for as little as a minute stimulates the production of oxytocin (Odendaal and Meintjes, 2003). Oxytocin in the hormone that enhances trust, cooperation and love between a parent and their child. Petting a therapy animal also releases endorphins making people feel better, diminishing feelings of pain, depression and loneliness. Helps build rapport and trust with a child who is nervous, withdrawn and/or afraid. Helps the child to relax through the unconditional and non-judgmental acceptance of the therapy dog. Helps reduce the child’s anxiety and stress, thereby allowing them better recall and focus. Helps family members and or guardians relax, which also aids in getting the best possible testimony from victims and witnesses. 1991: The Children’s Advocacy Center in Jackson, Mississippi first used courthouse therapy dogs to comfort children in court proceedings while they testified in abuse cases. 2007: The Second Judicial Circuit of Florida began its Courthouse Therapy Dogs Program, one of the first to use therapy dogs in judicial proceedings and in courtrooms. 2011: Florida was the first state in the U.S. to pass legislation authorizing use of therapy animals into courtrooms involving sexual offense cases under certain circumstances. 2014: Florida legislators refine the original law to allow therapy dogs in the courtroom on cases involving sexual abuse victims who were under 16 at the time the crime occurred, and for anyone who is intellectually disabled. 2017: Florida legislators further expand the law to allow courthouse therapy dogs and, for the first time, facility dogs, to work with child victims in dependency and family court involving cases of abuse or neglect. Also adds definitions for therapy dogs and facility dogs. >>Learn more Presentation by Stephanie Perkins, Program Coordinator, Tallahassee Memorial Animal Therapy.